Located on the Big Island's east coast just north of Hilo, the main attraction near Pepe'ekeo is the Hawaii Tropical Botanical Garden, featuring more than 2,000 species of flowers and palms in a natural tropical rainforest. Like many towns in this area, Pepe'ekeo was a thriving sugar plantation town in the late 19th century, which acted as a catalyst for its development. A series of parks, hospitals and restaurants made their way into the town during the 20th century. Progressive infrastructure combined with growth in the agricultural sector gave a distinct identity and economic prosperity to Pepe'ekeo. Take a trip down the town's memory lane by visiting the Pepe'ekeo Sugar Mill, which chronicles the era of the thriving sugar industry. 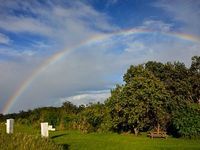 The biggest draw of the area, however, is the four-mile stretch of road between Papaikou and Pepe'ekeo, the Old Mamalahoa Highway, that leads past the Hawaii Tropical Botanical Garden. The tropical scenery here is stunning and a must-visit.